Are you after the sandiest beaches, most stunning scenery, and nicest beach resorts in Greece? 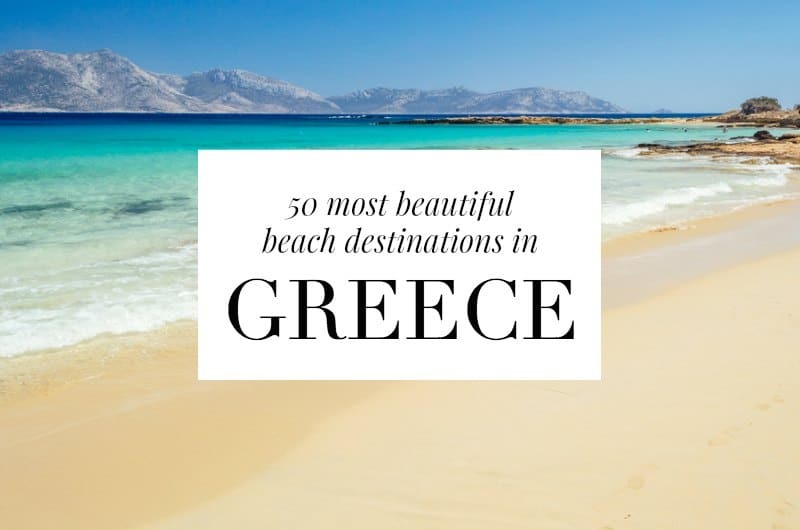 Well here’s a lovely big list for you – featuring 50 of the most beautiful places you can imagine for a beach vacation in Greece. Let’s kick off with somewhere you might never have heard of. Meganisi is a small lesser-known Greek island, just off the coast of Lefkada in the Ionians. It’s a small, verdant island with some incredibly picturesque beaches. You can visit as a day trip from Lefkada, drop in on a sailing trip, or stay in one of the island’s gorgeous upmarket villas. Right at the other end of Greek territorial waters, you’ll find the popular holiday island of Kos. And once you see the beaches on Kos you’ll understand the attraction. 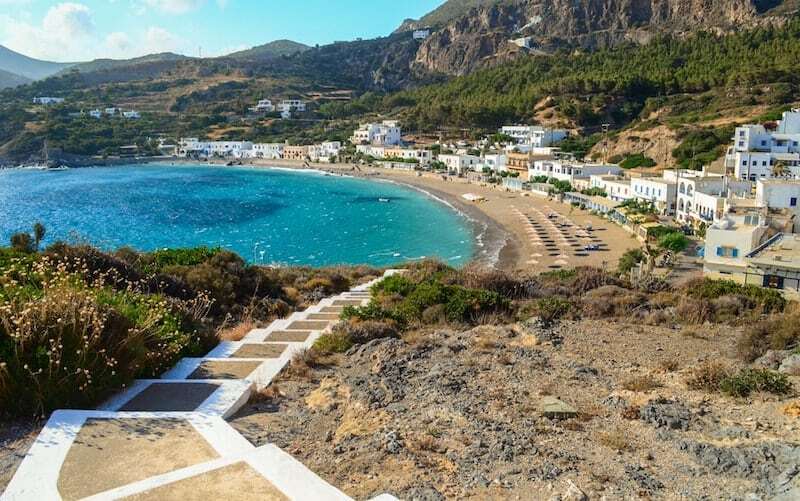 The quiet beach resort of Tigaki has one of the best wide sandy beaches in Greece – you’ll want to sink your toes right into that sand – but isn’t overcrowded. And as a bonus, the beach is west facing f0r incredible sunsets and it’s only a short bus ride into Kos Town for evening entertainment. On the other hand, if entertainment is your bag then let me introduce you to Mylopotas on Ios which is one of the best party beaches in Greece (although it’s not quite as crazy as it once was). Far Out Beach Club keeps revellers, particularly the backpacker crowd, entertained all day and night. It’s a 20-minute walk to the main town Chora where you’ll find more bars and clubs as well as pretty whitewashed streets. The other famous party destination in Greece is Mykonos, of course. 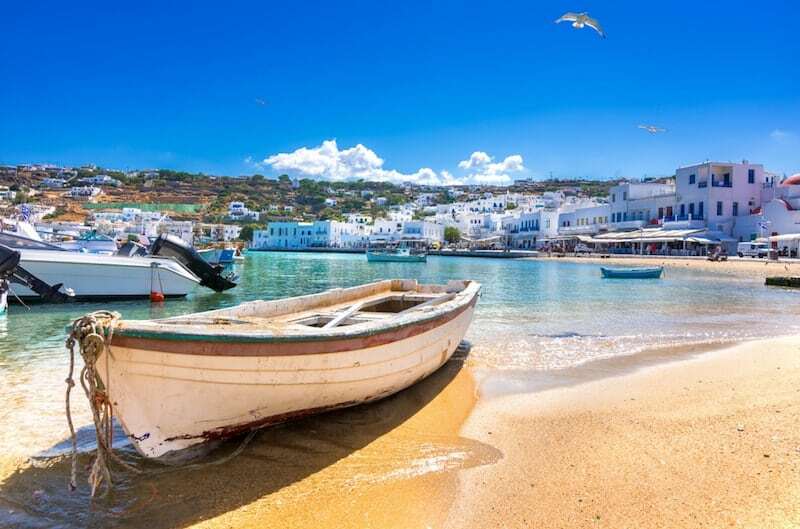 To stay right in the heart of the action grab a room in Mykonos Chora and head to Paradise or Super Paradise beaches for the parties. 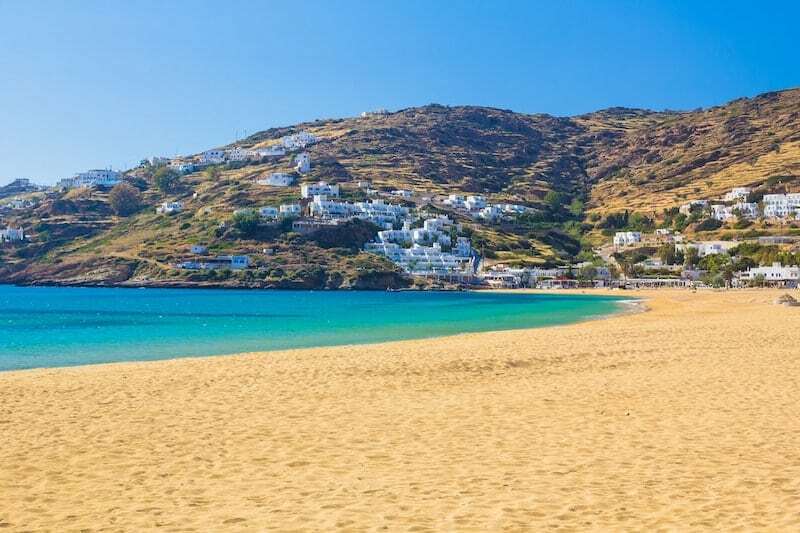 But for something a bit more chilled on Mykonos check out Elia which boasts the longest sandy beach on the island, sun loungers, watersports, and a decent selection of tavernas. But the atmosphere here is solidly family friendly. It’s 10km to Mykonos Chora if the nightlife calls. 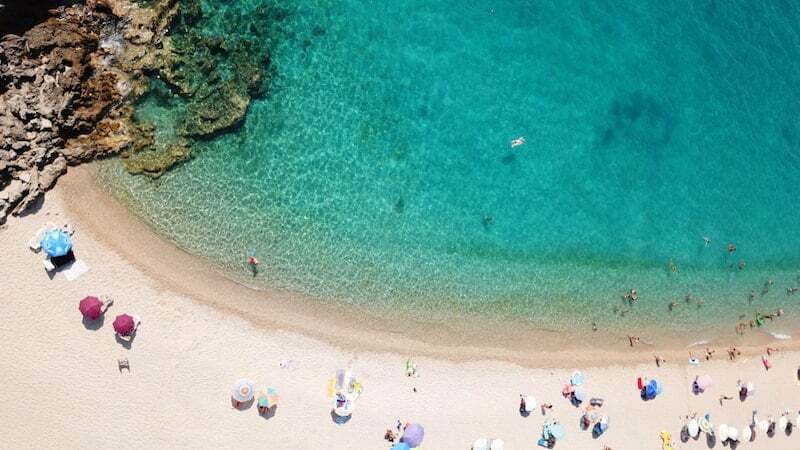 Naoussa is a beach town that strikes a perfect balance of nightlife and beach bliss, and is fast becoming one of the best beach resorts in Greece. 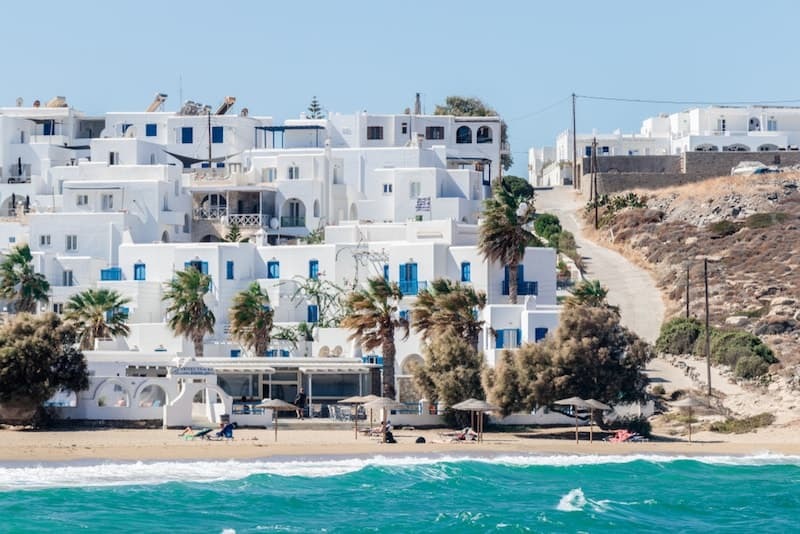 It’s also one of the prettiest places in the Cyclades thanks to the heavenly combination of blinding white buildings, blue woodwork and vibrant turquoise seas. There are plenty of excellent beaches in the Naoussa Bay area, and small boats that will whisk you to any of them. Just across the channel from Paros is Naxos, another one of the best islands in Greece for sandy beaches. And you don’t have to travel far to find one. 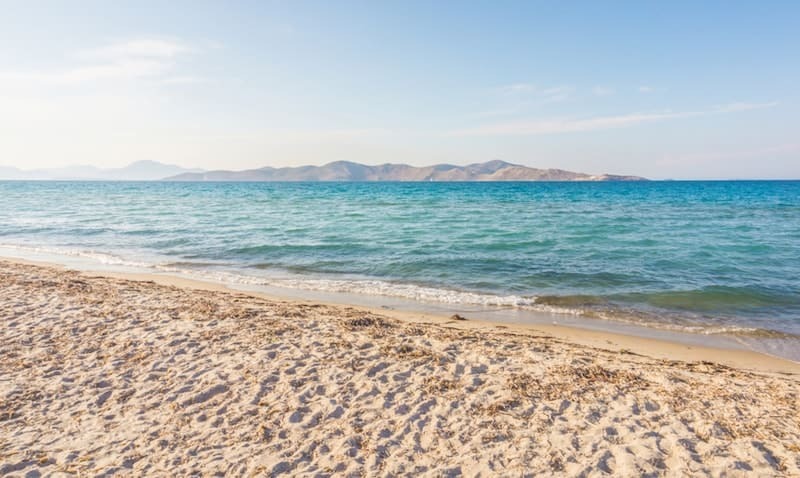 Simply jump off the ferry in Naxos Chora and stroll 5 minutes around the corner to the laid back town beach of Agios Georgios, a sandy crescent facing Paros with languid shallow waters and plenty of good value accommodation options near the beach. Corfu is one of the best places to stay in Greece for beaches, hence its enduring popularity. 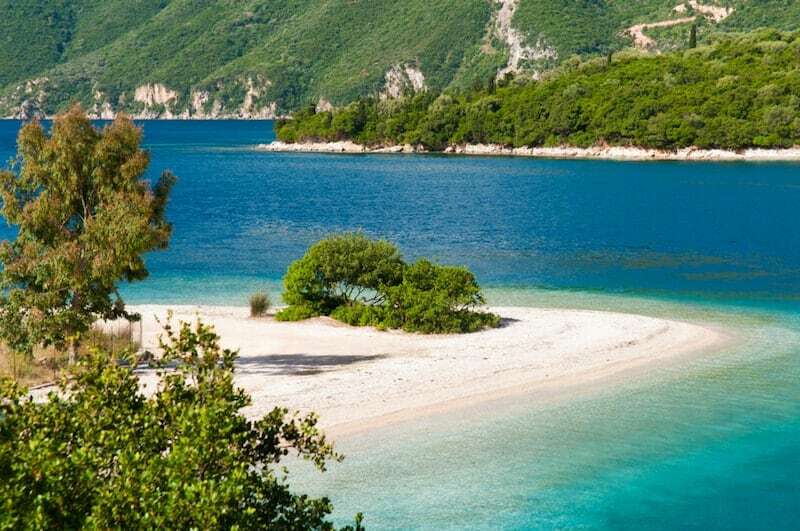 Charming Paleokastritsa attracts holidaymakers from for its jaw-dropping coastal scenery, cool waters and pretty coves. The resort winds around 6 small bays where you’ll find a range of apartments and traditional tavernas, all with views of the stellar sunsets. The town of Parga on the coast of Epirus – opposite Corfu – is one of the most beautiful (and colourful) coastal towns in Greece. 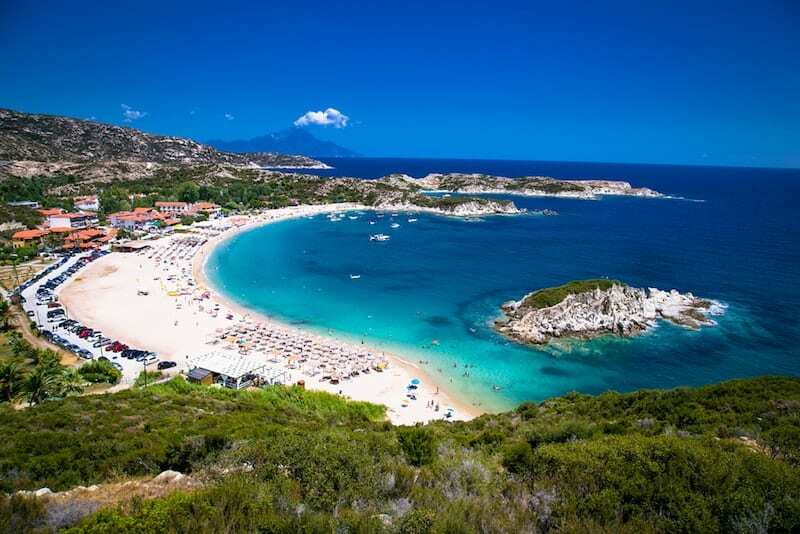 But it’s also home to some of the best beaches on the Greek mainland. 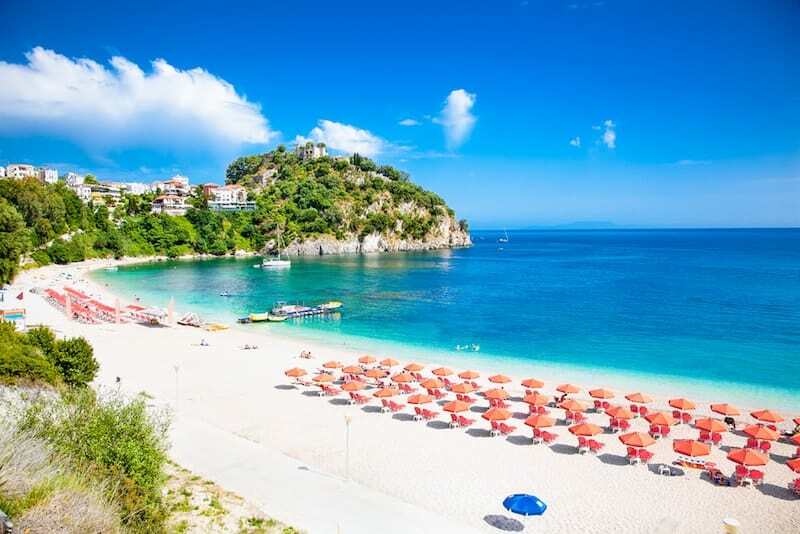 A 20-minute walk around Parga’s castle-topped headland is Valtos, a popular 3km stretch of small pebbly beach and crystal clear waters. There’s plenty of watersports and fun in the summer. If it all gets too busy there are numerous equally beautiful beaches in the area to discover. 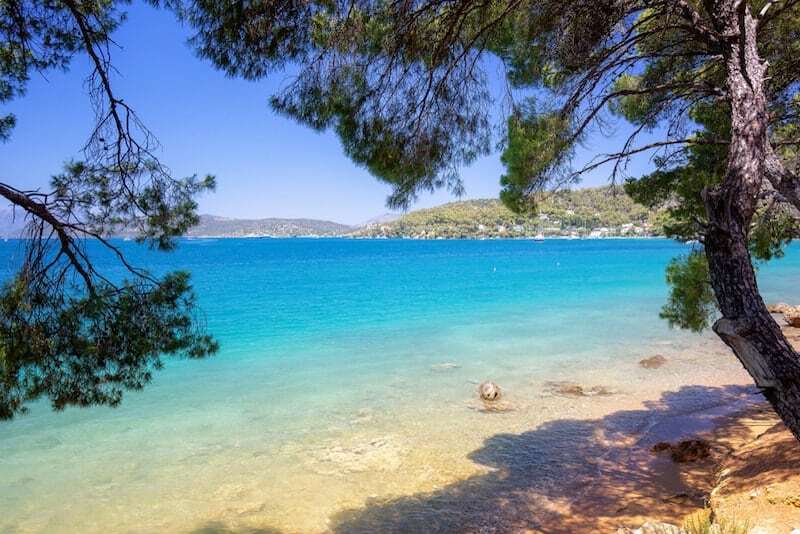 The jewel of Greece’s north-west coast is stunning Syvota. 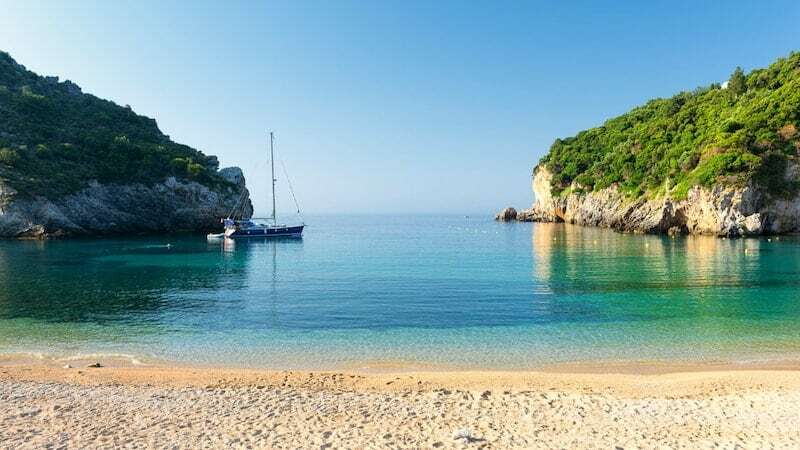 If you’re staying on nearby Corfu or in Parga then you’ll find boat trips offering excursions over the channel to the delightful beauty spot. There’s a smattering of exotic-looking beaches and upscale hotels in the area for those looking to stay. 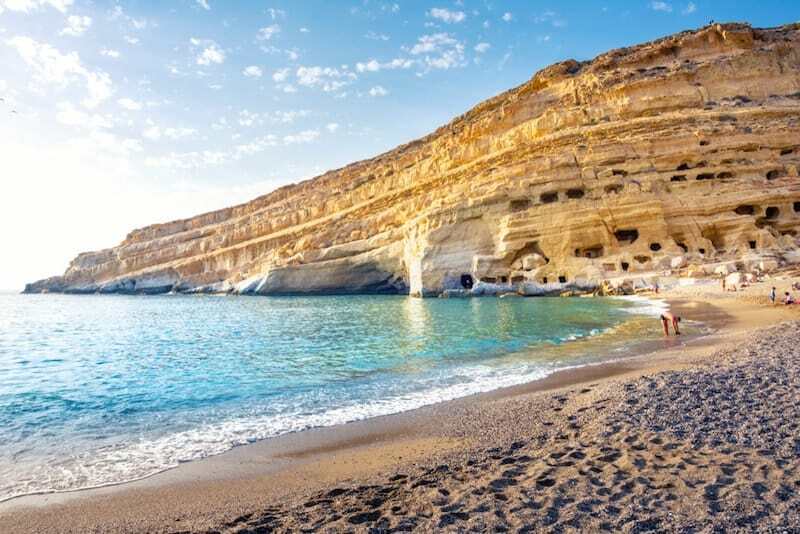 Most tourists don’t make it as far as Kythira, the island tucked away between Crete and the mainland, so it’s perfect for those searching for an off-the-beaten-track beach experience. Small but lively Kapsali has two sandy crescents backed by a pretty white village and overlooked by a castle. 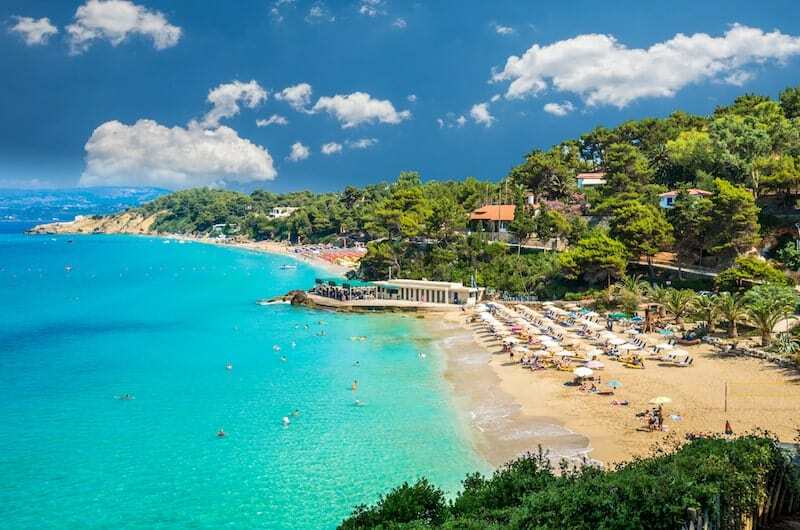 The island of Skiathos in the Sporades is one of the most well-established destinations for a beach holiday in Greece. Tour operators have been bringing Europeans here for decades, drawn by its lush green landscape and fine golden sands. 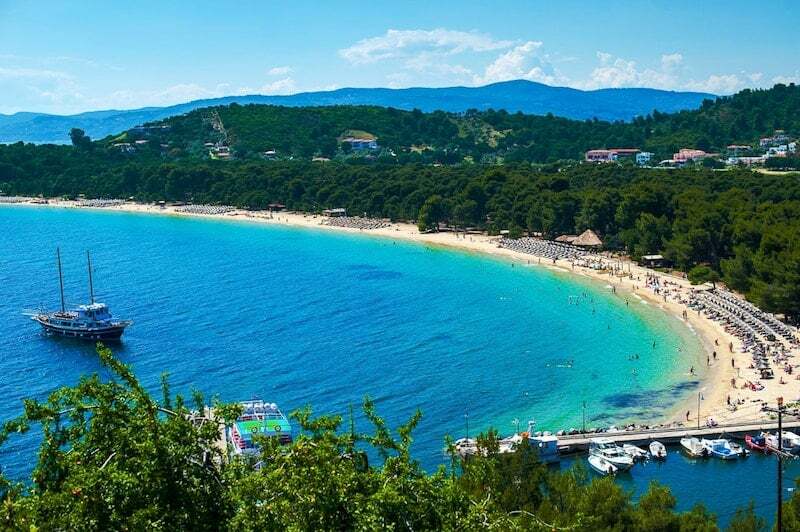 Many visitors opt to stay in Skiathos Town for its cosmopolitan buzz, but Koukounaries is its most well-known beach resort. For traditional Greek island charm (and excellent food) try Sifnos. The ferry arrives at Kamares, where you can hop off the boat and be on the boat in a matter of seconds in lovely laid-back Kamares. 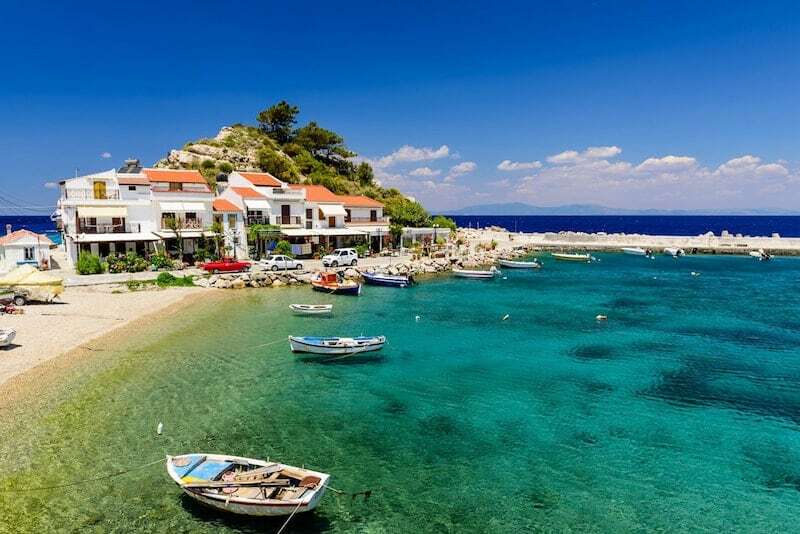 The Aegean island of Samos has all of the convenience of an international airport and plenty of packages available through tour operators but hasn’t been spoilt by mass development. 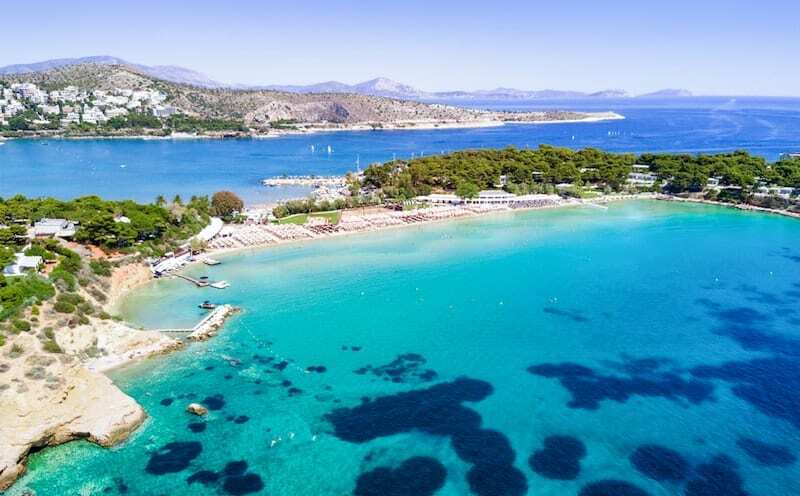 Stay in photogenic Kokkari which has a wide choice of accommodation and good tavernas, but the best beaches on the island are wild and beautiful so be prepared to hire a car to see the best of it. Andros is not the first island that springs to mind when you think of vacation spots in Greece – unless you’re a hiker. But this underrated island is home to some of the best -and emptiest – golden sands in the Cyclades. The main tourist resort (though still pretty quiet) is Batsi, a short drive from where the ferries dock at Gavrio. Matala is famous for its hippie caves – Joni Mitchell even resided in them for a while in the 1960s and wrote about it in her hit song ‘Carey’. 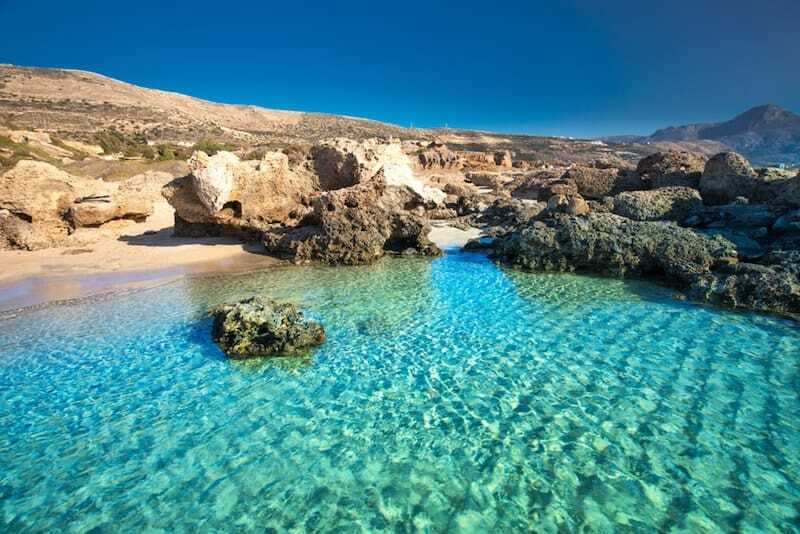 Most of the hippies are long gone and you can no longer access the caves, but it’s still one of the most enjoyable beach towns on Crete and there are some superb hidden coves around the coast ripe for exploring. 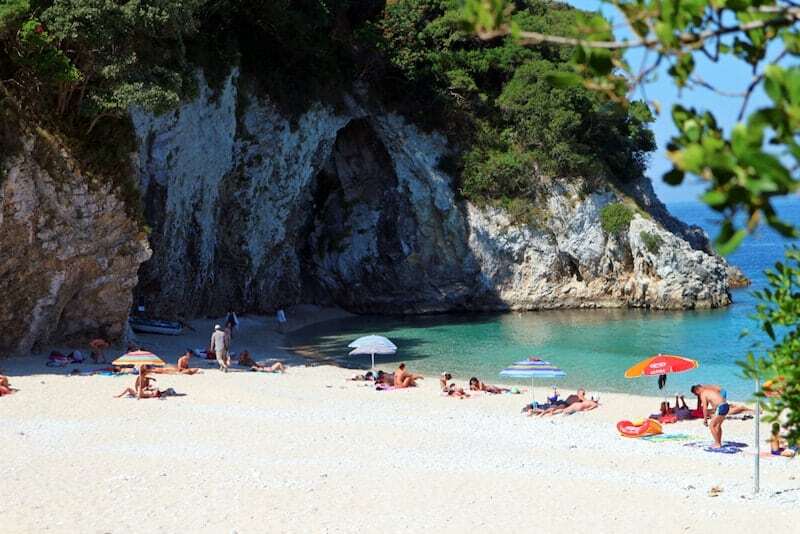 The excellent sandy beach of Karavostasi often gets overlooked by the more popular beaches around Parga and Syvota, which is all the better for those who do make the effort. Karavostasi feels wild and remote and gets some big waves, but has a few low-key hotels and is not too far from bigger resorts. The ‘other Bali’ is one of the nicest small beach resorts in Crete. A buzzing fishing village on the north coast, Bali is not far from the city of Rethymno with its Venetian old town. It has a cosmopolitan selection of hotels and tavernas tucked away in its pretty hills. A world away from Bali is the windsurfing mecca of Paleochora on Crete’s far south-west tip. It has two big beaches (so you can escape the wind blasting) and a very relaxed vibe – a leftover from its hippie heydey. But one of the best things about Paleochora is its close proximity to the famous pink beach Elafonisi and the hikes around the Samaria Gorge. 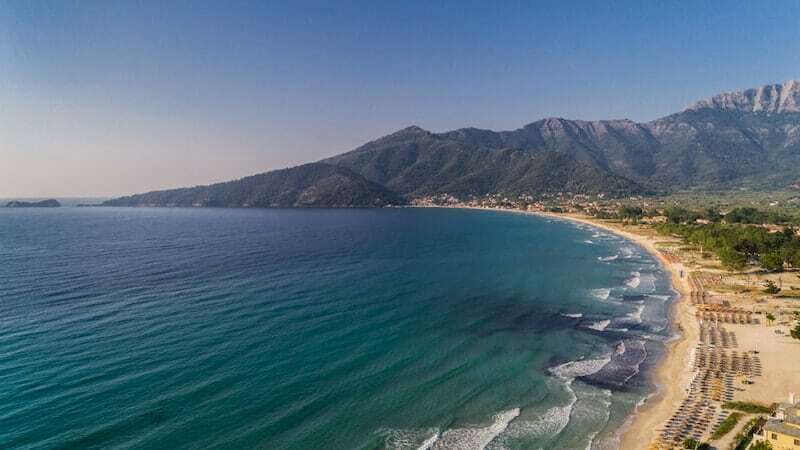 Kefalonia has some of the most beautiful and dramatic beaches in Greece (such as Myrtos, Petani, Antisamos) but the wild landscape means many of the beaches are unsuitable for development. Not a problem at Lassi, one of the main resorts on the island, where a strip of development is hidden in the greenery behind a string of beaches. 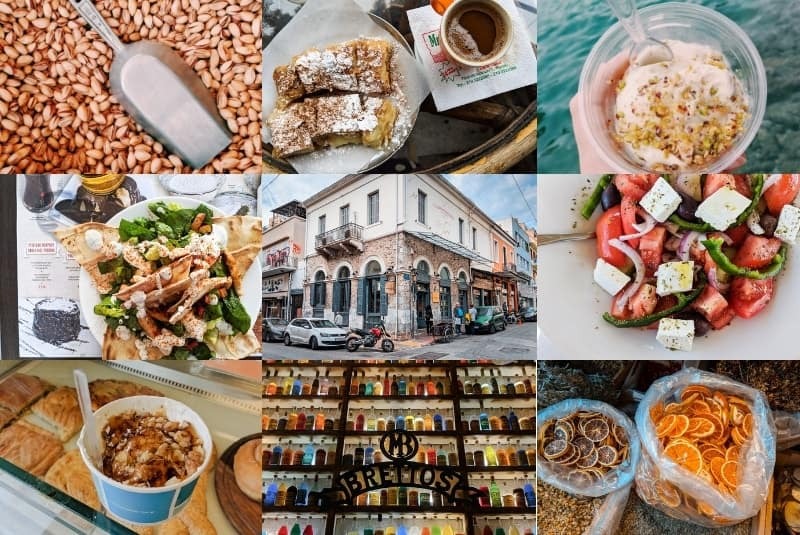 Lassi is almost a suburb of the island’s capital Argostoli, so it’s well-placed for road links and evening entertainment. So many tourists head straight for Paleokastritsa on Corfu that they leave little Liapades, just 4km along the coast, relatively untouched. This is Corfu Level 2. Liapades is a small-ish village with several small bays, the most gorgeous of which is Rovinia. To the south of Liapades are the wildest and most remote beaches in all of Corfu (you’ll need a boat to get there). Tiny Agistri is one of Greece’s true hidden gems. This island is only a short and cheap ferry ride from Athens, but hardly any international tourists. Probably because there’s not much to see or do other than relax and enjoy the natural surroundings. Perhaps it’s a blessing that photos don’t do Agistri justice. You can get off the ferry and straight on to the beach, or walk 10 minutes to Rosy’s Little Village – the best place to stay on the island. 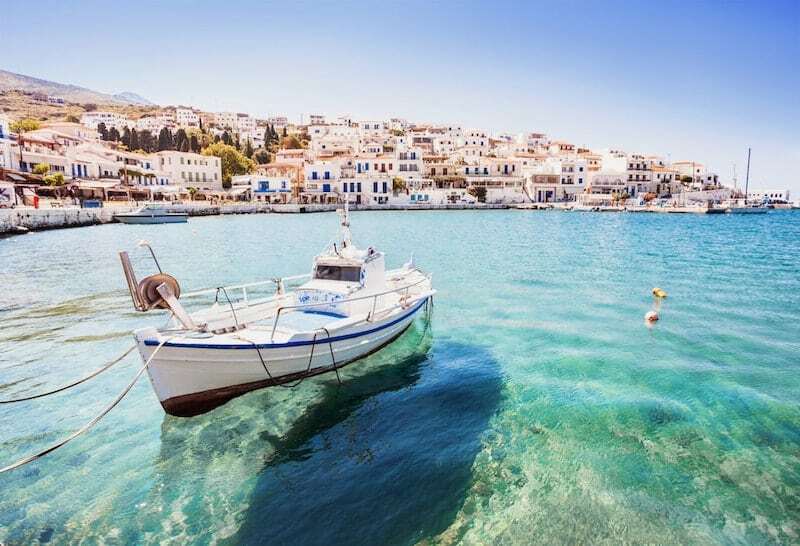 Koufonisia is perhaps the ultimate summer paradise in the Greek islands. 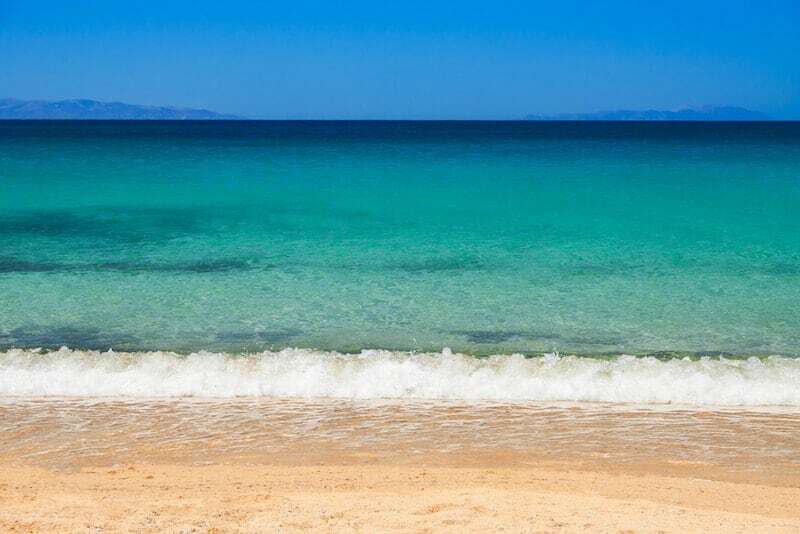 Take the small ferry from Naxos and you’ll disembark right next to the most heavenly sands. Think barefoot beach bar charm and seas of the most impeccable shade of turquoise. 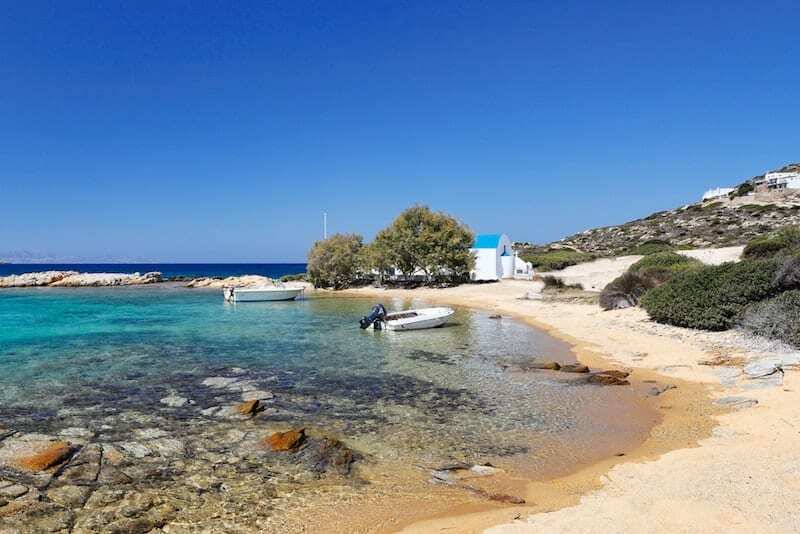 A similarly bijou and carefree delight is little Antiparos, a satellite island of larger Paros. A perfect little island to chill out for a few days, it’s slowly becoming more popular (thanks to some celebs who patronise the island) but still retains some of its original counter culture vibes. 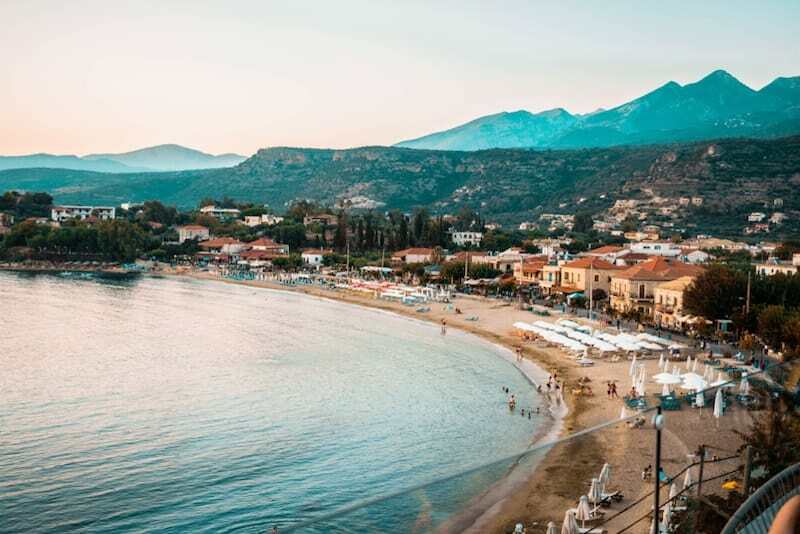 Another beach destination with a famous association is Stoupa, which is one of the most popular small resorts in the Peloponnese. 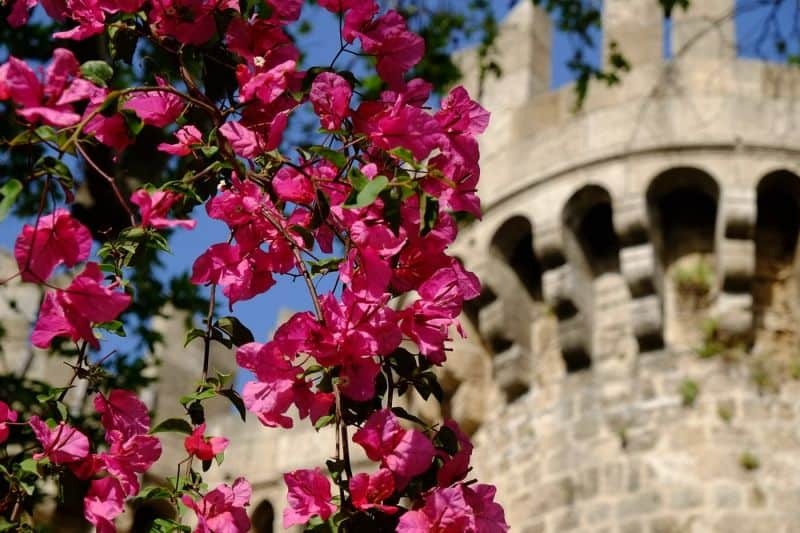 The town of Lindos is one of the star attractions on Rhodes. Lindos has it all: charming whitewashed streets, ancient ruins, a castle, and several gorgeous sandy beaches. Numerous plush upscale hotels skirt the roads leading out of town. 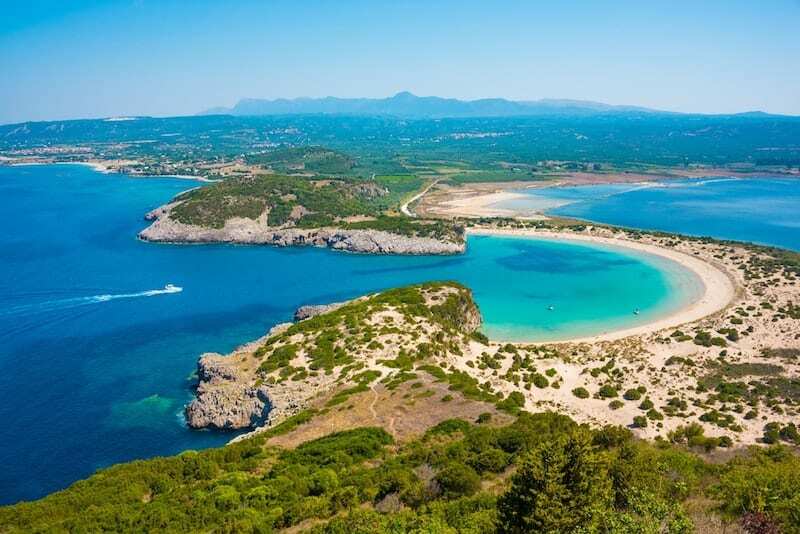 A rising star in the Greek tourism scene is the newly-opened luxury resort of Costa Navarino on the west coast. The area comprises a cluster of high-end hotels and villas which blend seamlessly into the local landscape and have a focus on sustainable tourism. The village is not far from the Voidokilia beach – one of the most beautiful beaches in the country. Dreamy Skopelos in the Sporades is home to lush landscapes and emerald seas. The idyllic fishing village of Agnontas is one of the most charming spots on the island – come here for fresh fish suppers and incredible sunsets. For a remote desert island feel and nights of ouzo and clear starry skies, the little island of Pserimos is relaxed and unspoiled. Most visitors just come for the day. By evening you’ll feel a million miles away from the rest of the world. The harbour town of Kassiopi is one of Greece’s classic beach resorts. It has history (including a Byzantine castle), nightlife, a village feel, great scenery, and its rocky coastline is scattered with stunning (pebbly) beaches. Is Assos the most beautiful village in Greece? Quite possibly. Its colourful Italianate architecture was restored (with help from the French) after the earthquake of 1953 destroyed much of the original architecture. There’s a Venetian castle on the hill, some delightful tavernas by the water, and several small beaches. Syros is a hugely underrated destination in the Greek islands. The elegant architecture of Ermoupoli is what attracts most visitors, but it also has some excellent quiet and sandy beaches such as Agathopes Beach in Poseidonia where you’ll find shallow waters and a few small hotels. 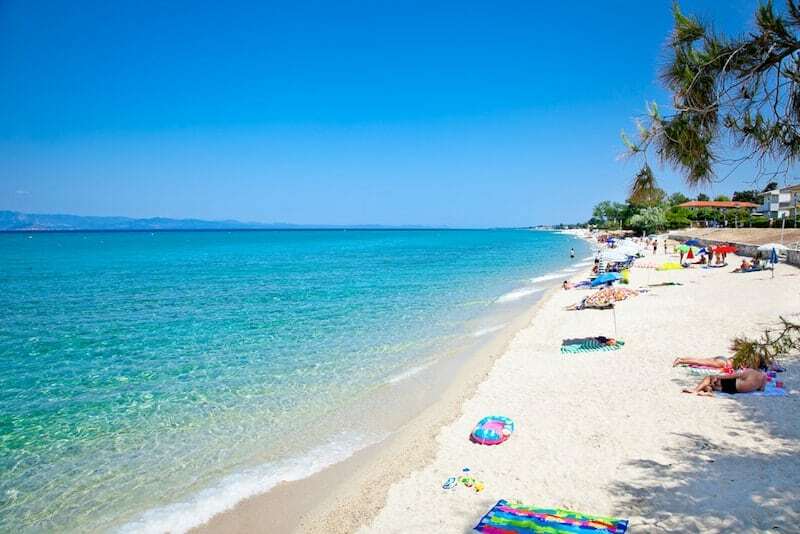 Some of the best sandy beaches in Greece are up in the north, in Chalkidiki’s fingerlike peninsulas. 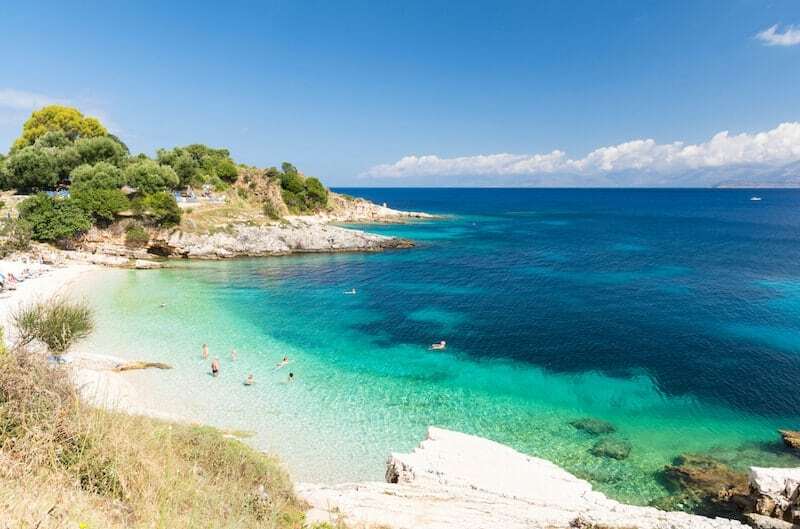 If endless beaches and crystal clear water is what you’re after, then head to the Kassandra Peninsula where the popular modern resort of Hanioti makes a decent base for exploring the region. Or head further along the coast to Pefkochori for more of a local vibe. You don’t have to leave Athens to have a beach holiday! Follow the coastline south of the city and you’ll hit the Athenian Riviera, where you’ll find everything from posh suburbs to thumping beach clubs and secret nudist beaches. The most famous is Astir Beach, home to an exclusive private beach club and recently renovated hotel (the Astir Palace). You can buy a day pass for the beach club, but the public beaches in Vouliagmeni are pretty good too. The small and scenic beach resort of Olympiada in northern Greece enjoys a splendid setting nestled in amongst green mountains. It has wonderful golden sands and is popular with locals (but is still an undiscovered gem amongst foreign holidaymakers). The fragrant pine-clad island of Poros is one of the closest islands to Athens. It’s known primarily for the scenic sea approach to Poros Town. Less well known is the tranquil Love Bay, a tiny tranquil paradise just a short walk from the ferry dock. A few hotels are well placed to make the most of their shady setting amongst the pines. 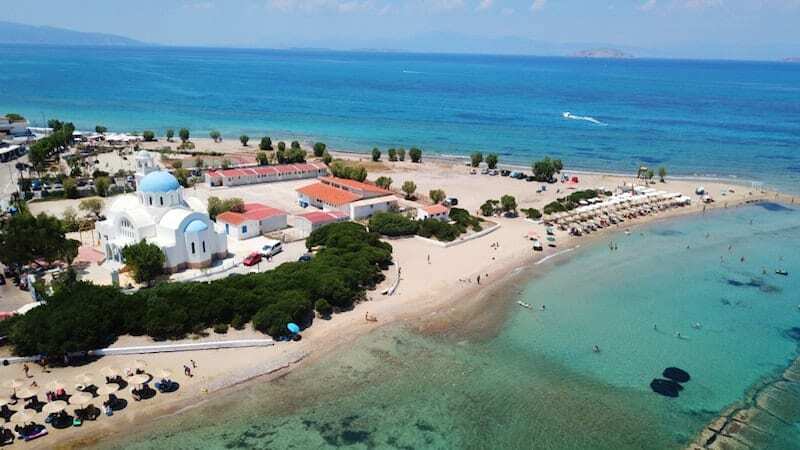 With its wide golden sands and lovely scenery, Agios Georgios must quietly be one of the best all-around places to holiday in Greece and has its fair share of devotees (particularly families and those looking for a quiet relaxing holiday in scenic surroundings). A short walk around the crescent beach and headland takes you to the picturesque hotspots of Porto Timoni beach, and Afionas and Pagi villages. 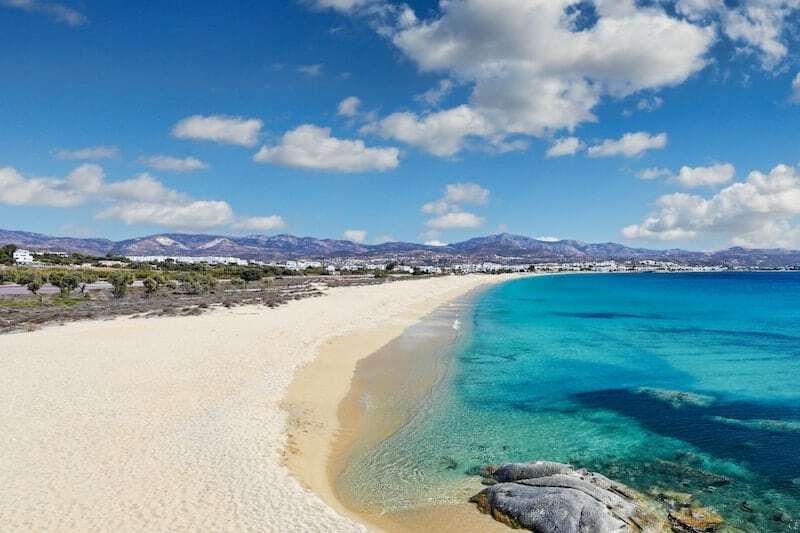 Agios Prokopios on Naxos has one of the best sandy beaches in Greece. The long, wide sandy beach gently tapers around the corner into neighbouring Agia Anna. It’s chilled and family friendly but there are a few late bars and clubs over high summer. It’s a short bus ride from the airport or Naxos Chora. 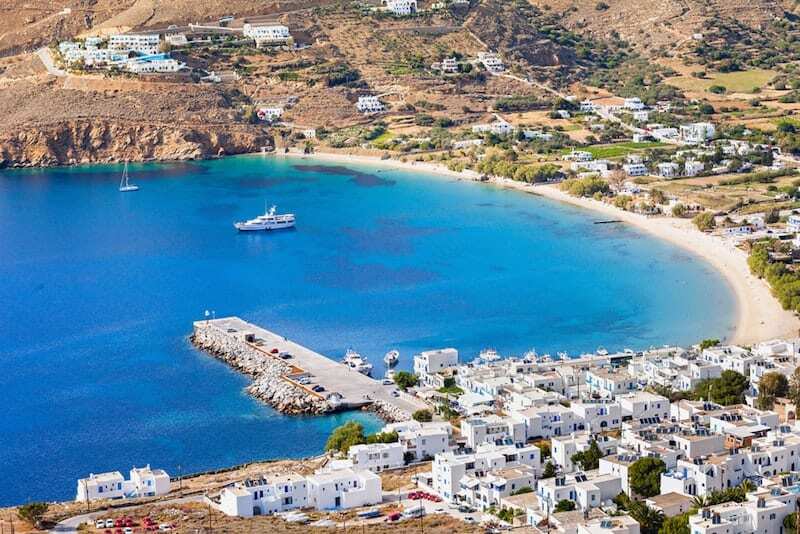 The small beachside town and port of Aegiali capture that Cycladic essence that everyone loves, with its tumbling white houses, blue seas and sandy beach. It’s well positioned for exploring the natural beauty and star attractions of the island. Pefkos is a traditional small Greek holiday resort on the island of Rhodes. 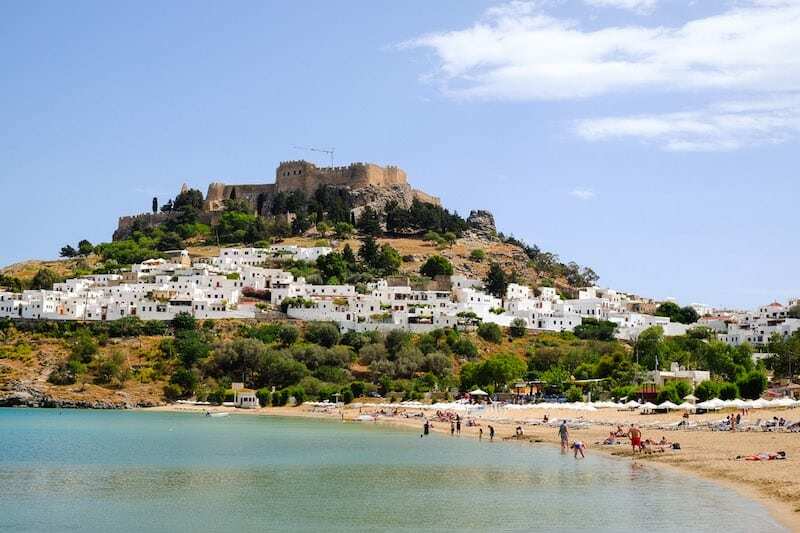 Quieter than neighbouring Lindos, and without the daytrippers that descend upon it daily, Pefkos has a low-key low-rise charm and plenty of good tavernas that keep its fans (mainly Brits) returning year after year. The small Ionian island of Paxos is one of the top vacation spots in Greece for beach-lovers in the know. The colour of the water here is amazing. 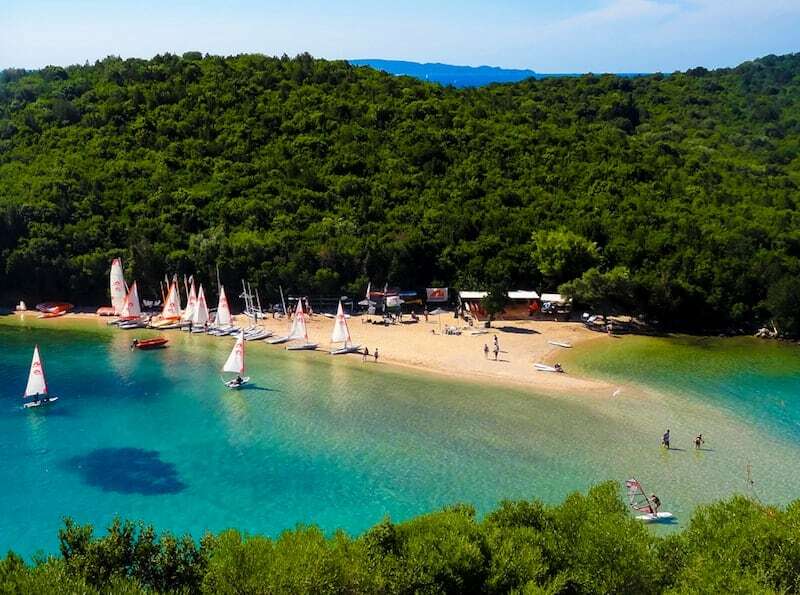 Popular with yachties, Paxos (and it’s small satellite island Antipaxos) is an idyllic place to get back to nature, enjoy the local wine and the sound of cicadas. 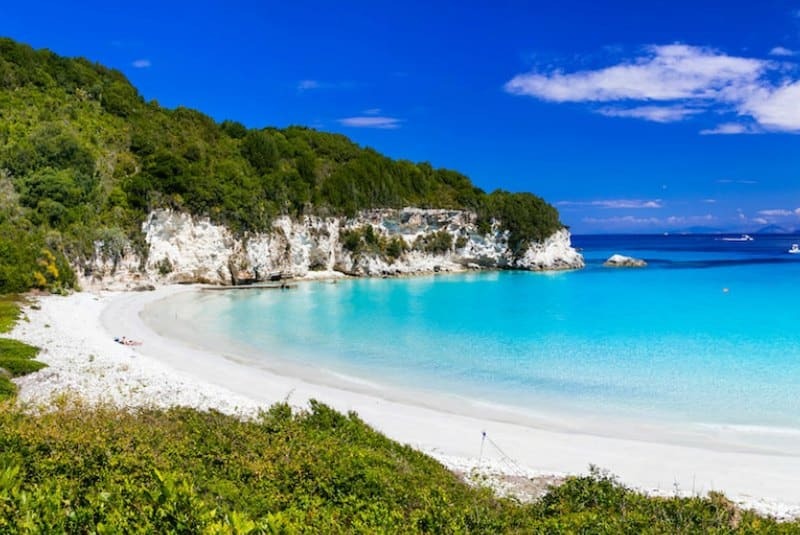 The best beaches of all (Voutoumi and Vriki) are on Antipaxos. The mainland Pelion peninsula is uncharted territory for most visitors to Greece. Its lush green landscape mirrors that of the nearby Sporades islands but minus the crowds. Tranquillity is the name of the game here. 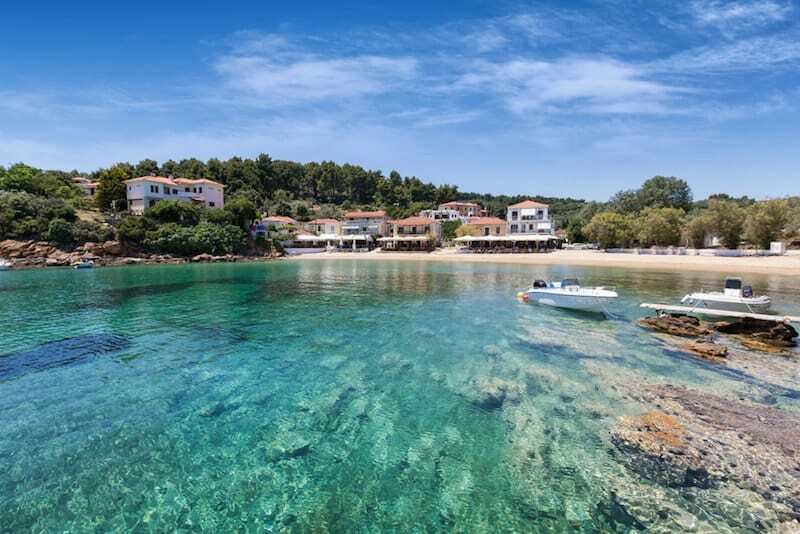 Katigiorgis is a small unspoiled fishing village with a few apartments and tavernas – you can enjoy the peace and watch the sun come up over Skiathos, or nip over by boat transfer for the best of both worlds. 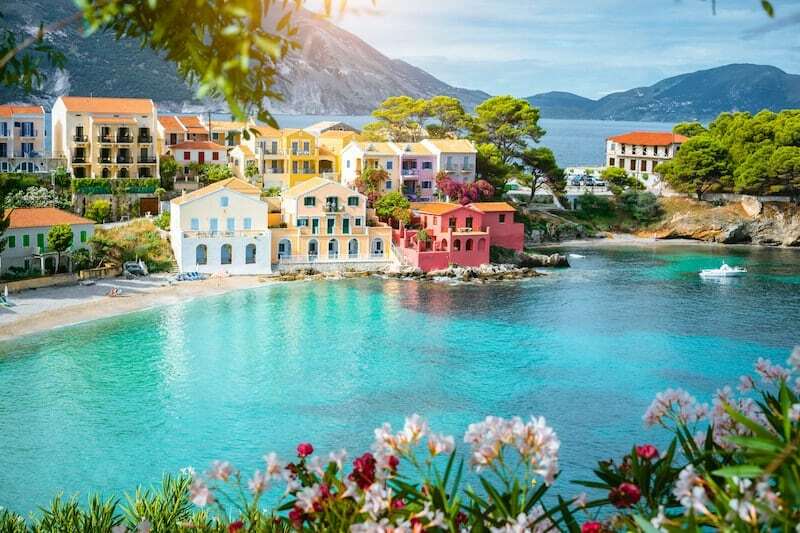 For a proper bucket-and-spade holiday the resort town of Skala on the island of Kefalonia checks all the boxes. It has a wide 3km sand-shingle beach and plenty of good value accommodation right. It’s one of the most popular resorts in the Ionians, with everything from simple rooms to large all-inclusive hotels available. Whilst it’s not quite a party resort it has a lively buzz and a long season and is surrounded by some beautiful scenery and hikes. 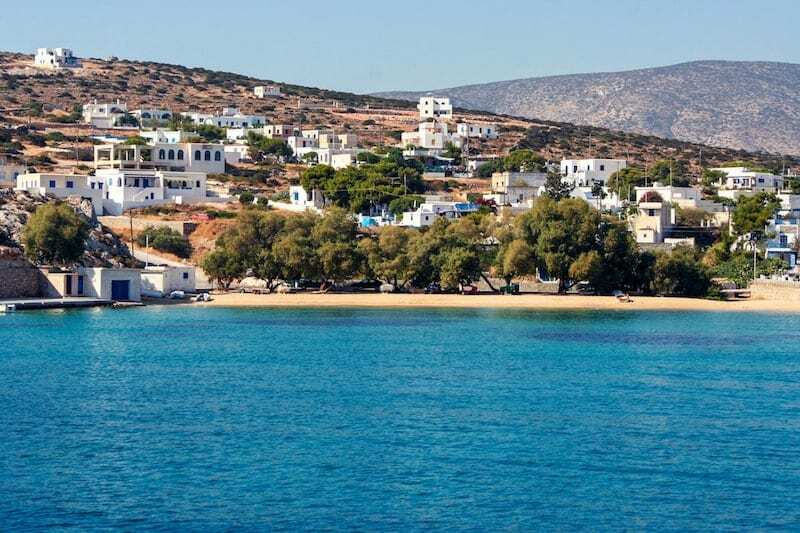 Whilst Koufonisia gets most of the press, there are three more inhabited islands in the Little Cyclades group to explore – all equally picture-perfect. Iraklia has two villages, remote sandy beaches, and a handful of rooms for the intrepid to rent. 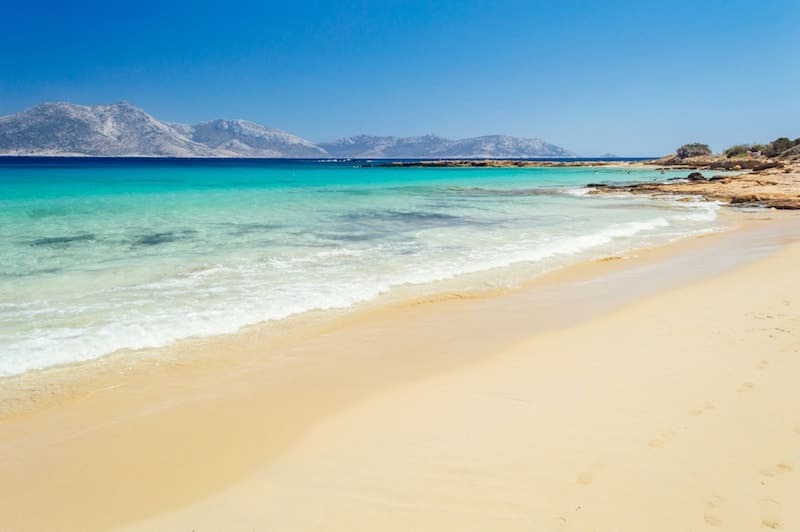 Beach-lovers heading to Western Crete will inevitably be drawn to the big-name beaches of Elafonisos and Balos, two of the most beautiful beaches in Greece with their pink-tinged lagoons. But not far away is the excellent beach at Falasarna – gloriously crowd-free in comparison. 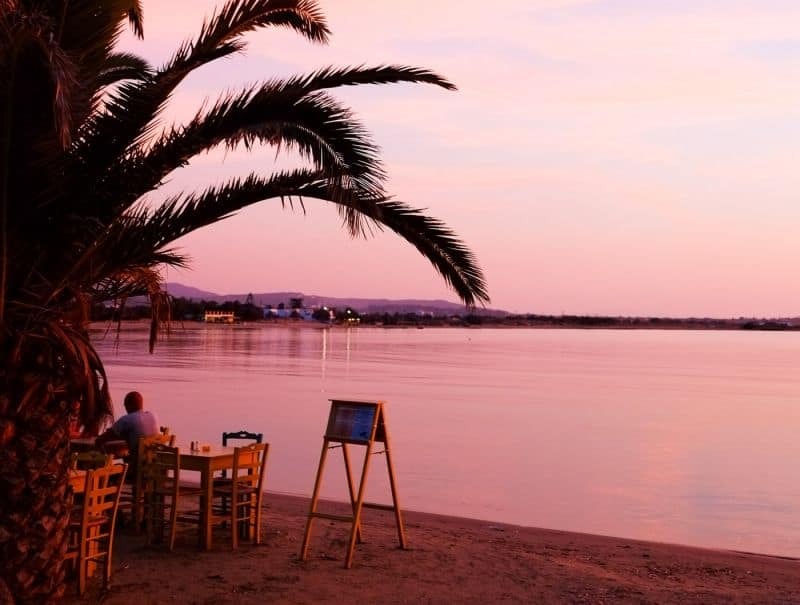 It’s big, sandy and rustic, with a few small hotels and tavernas right on the seafront. 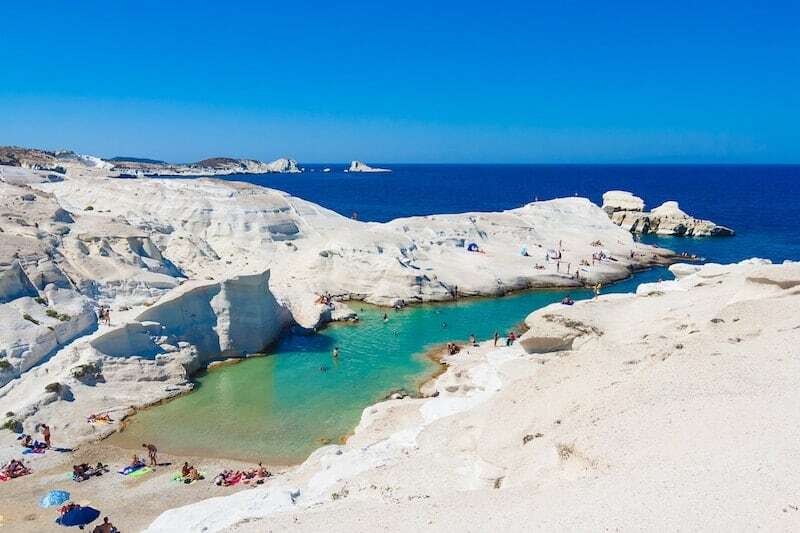 The volcanic island of Milos is best known for Sarakiniko Beach with its white lunar rocks, but did you know it also boasts a huge number of pristine sandy beaches with a variety of landscapes? Tsigrado and Provotas are two of the most popular. The best beaches are remote and spread out around the island, meaning it’s is best for beach explorers with their own wheels and a sense of adventures rather than those looking for a fly-and-flop. Free spirits rule at small but beautiful Kalamitsi, located at the bottom of Sithonia -Chalkidiki’s middle peninsula. Calm, clear waters lap at the sandy main beach where you’ll find laid-back tavernas and beach bars. Kalamitsi is a popular spot with free campers, and also keen divers who come to enjoy some of the best dive sites in Greece. 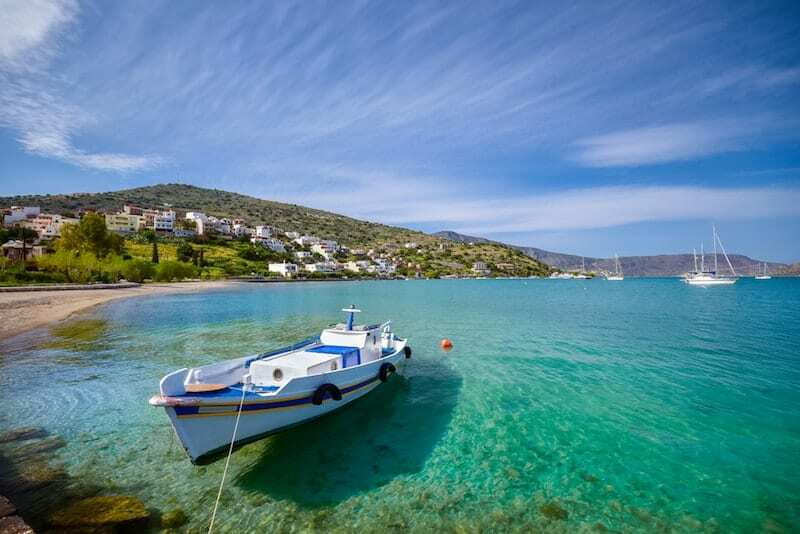 Once a tiny fishing village, Elounda has become one of the premier beach resorts on Crete. It’s home to many of the most upmarket hotels and villas on the island strung out along its pretty coast. 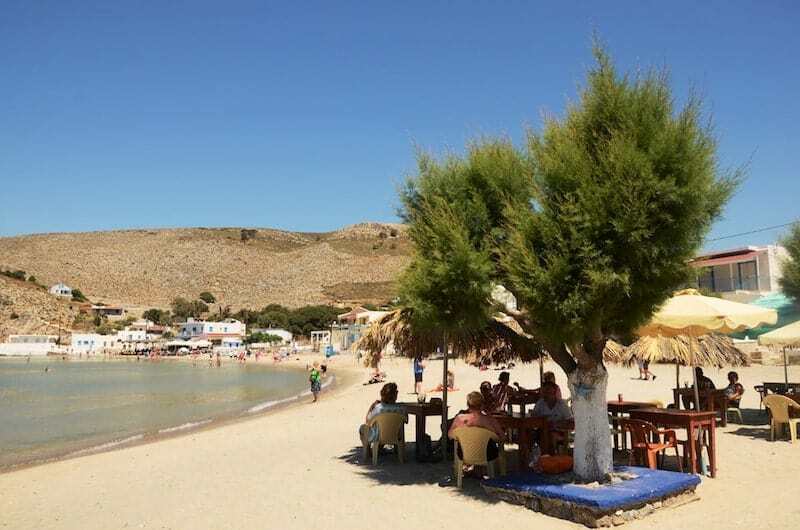 But it also has a vibrant harbourfront with plenty of great tavernas, some fascinating historic sites nearby and a small sandy Blue Flag beach. The beaches on Naxos get emptier the further away you get from Naxos Chora. A perennial favourite is the long sandy beach at Plaka – at 4km, there is space enough for everyone to spread out. 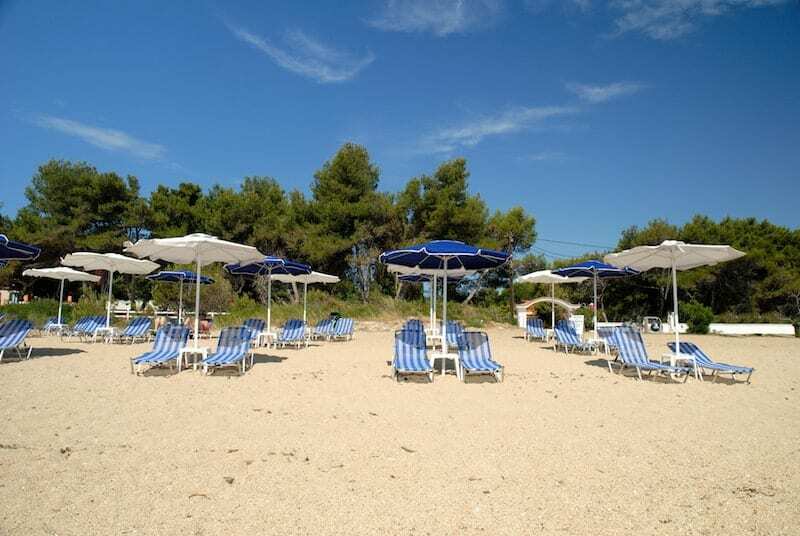 Some sections of the beach are organised with sun loungers and beach cafes, others are empty save for a few daytrippers plopped under the cedar trees on the beach. Clothing is optional at end of the beach tucked away behind the dunes. 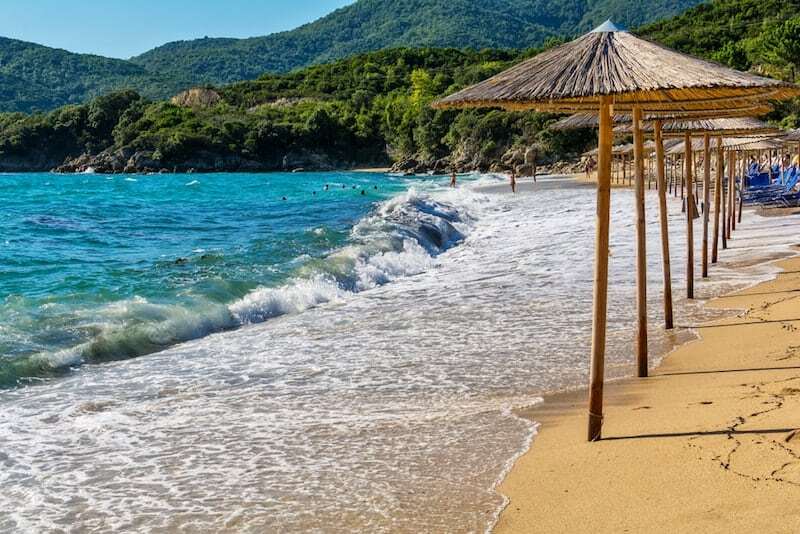 This beach resort on the northern island of Thassos is blessed with turquoise waters, green mountainous scenery and – you guessed it – a huge sweep of fine golden sands. 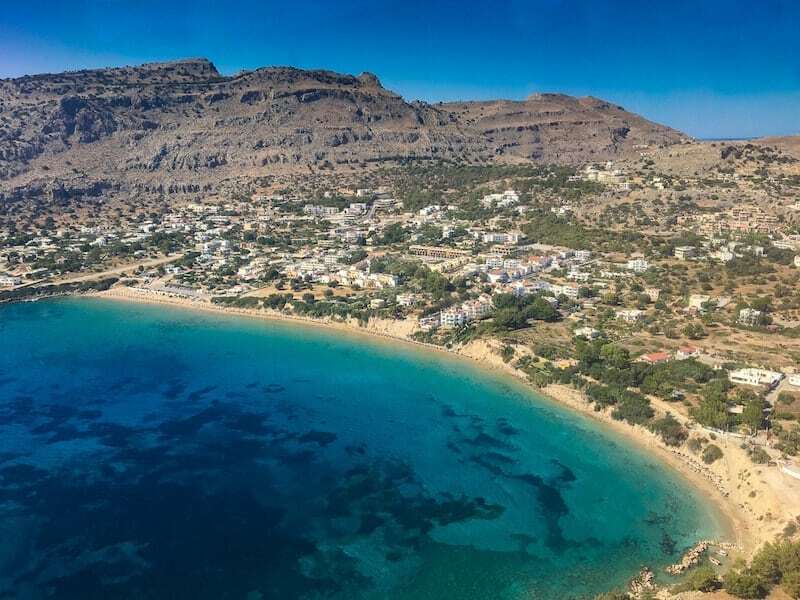 There are two villages along the beach – Skala Panagia and Skala Potamia – which are gradually growing towards each other. This laid-back beach is becoming more popular, especially with families thanks to its calm and safe Blue Flag seas. Which Are the Quietest Greek Islands for Escaping the Crowds? Hi, I’m Steph! I’m on a mission to uncover the best travel secrets in the Mediterranean. I love local food + wine, epic historic sites, and sailing.You can learn more about me over here. Enter your email address to receive new posts by e-mail. Don’t miss out on new posts – enter your email address to receive updates monthly. The Mediterranean Traveller is a participant in the Amazon Services LLC Associates Program, an affiliate advertising program designed to provide a means for sites to earn advertising fees by advertising and linking to Amazon.com and other Amazon sites.